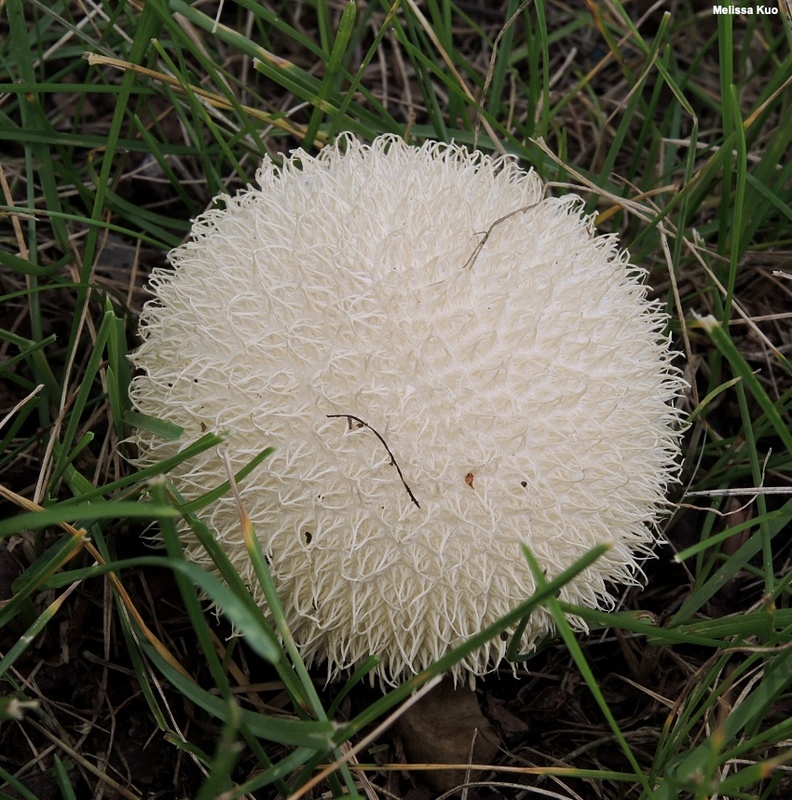 Here is a beautifully spiny puffball that features especially long spines that measure 2–4 mm long or more, and are often joined at their tips. Lycoperdon pulcherrimum is white to whitish, remaining so throughout its development. It is found in woods and in urban areas near trees, and is usually about the size of a golfball or slightly larger. 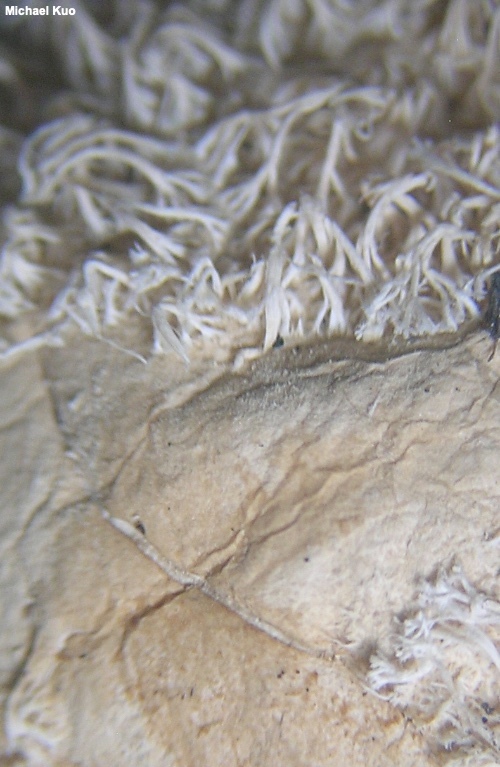 Vascellum curtisii is very similar, featuring long spines and persistent white colors, but it features smaller, marble-sized fruiting bodies and grows only in grassy areas or in woodchips; it also differs microscopically. 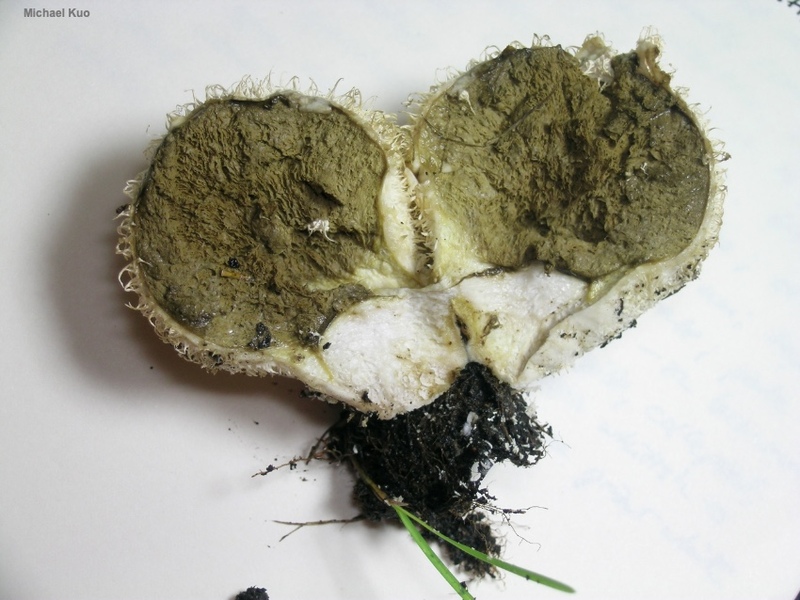 Lycoperdon americanum is also similar, but can be separated by the fact that its surface is pock-marked or even reticulate where spines have fallen off, while the surface of Lycoperdon pulcherrimum remains smooth. Ecology: Saprobic; usually growing alone or scattered, in woods or in urban settings, usually with trees nearby; summer and fall; originally described from Pennsylvania, but primarily distributed in the Great Plains states and the Midwest, though not infrequently reported from the southwest and the eastern United States. The illustrated and described collection is from Illinois. 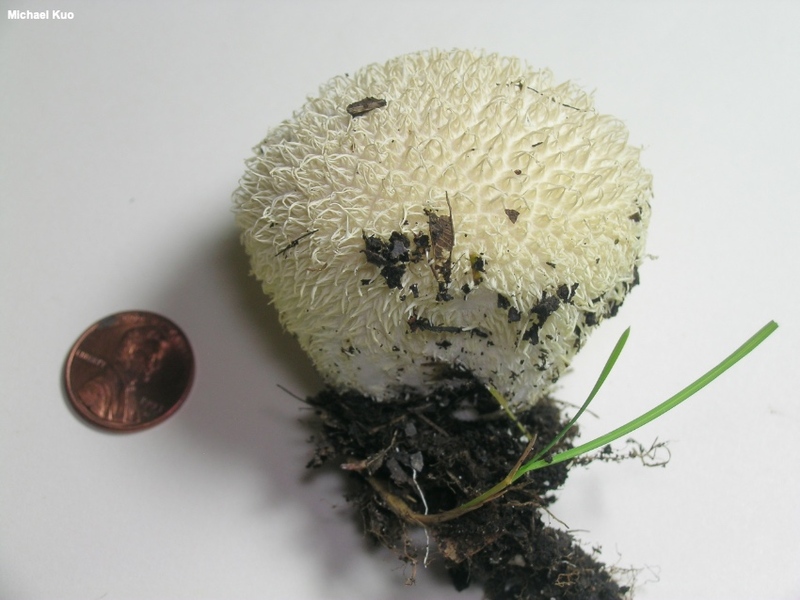 Fruiting Body: Round, or shaped like an inverted pear; 2–6 cm wide; 2–5 cm high; dry; densely covered with soft, long spines 2–4 mm long, often united at their tips to form aggregations of twos, threes, and fours; white to whitish and remaining so throughout development; surface beneath spines bald and unmarked when spines fall away or are removed; skin 0.5–1 mm thick; interior flesh white and spongy at first, becoming yellowish and then olive, eventually turning into olive brown spore dust except in the sterile base. Microscopic Features: Spores 4.5–6 µm including ornamentation; globose; spiny, with spines about 1 µm long; often with a 1–2 µm; pedicel. 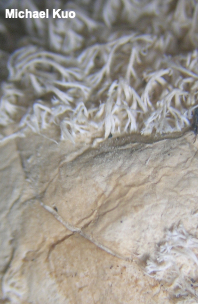 Capillitial threads 3–7 µm wide; walls 0.5–1 µm thick; occasionally branched; smooth; no pores found; olive to olive brown in KOH. REFERENCES: Berkeley and Curtis, 1873. (Smith, 1951; Smith, Smith & Weber, 1981; Weber & Smith, 1985; Arora, 1986; McKnight & McKnight, 1987; Bates, 2004; Calonge et al., 2004; Bates, 2009.) Herb. Kuo 06271504.